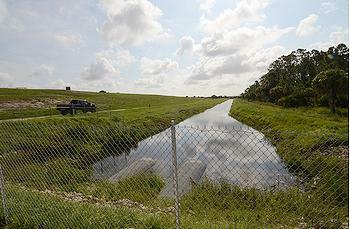 WASHINGTON, DC, August 15, 2011 (ENS) – To protect the Northern Everglades Watershed, the federal government will provide $100 million in financial assistance from the Wetlands Reserve Program of the Department of Agriculture’s Natural Resources Conservation Service. The funding will go to acquire permanent conservation easements from eligible landowners in four Florida counties and to assist with wetland restoration on nearly 24,000 acres of agricultural land in the Northern Everglades Watershed. 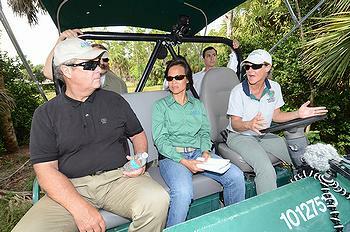 Agriculture Secretary Tom Vilsack announced the funding on Thursday before taking a swamp buggy tour of the Winding Waters Natural Area in West Palm Beach with state and local officials. The Natural Resources Conservation Service offers easement programs to landowners who want to maintain or enhance their land to benefit agriculture and/or the environment. In this case, the funding will be offered to landowners in Glades, Hendry, Highlands and Okeechobee counties. All NRCS easement programs are voluntary. Florida elected officials praised USDA efforts to protect the Northern Everglades, particularly since the vast wetland is a major source of fresh drinking water. “With this funding, it is my sincere hope that we can better address the water infrastructure problems to ensure Florida has a stable supply of clean water,” said Hastings. In June, over the opposition of more than 50 agricultural and conservation groups, the U.S. House of Representatives approved nearly $1 billion in cuts to USDA conservation programs, including the Wetlands Reserve Program, in the agriculture appropriations bill for Fiscal Year 2012. The Senate is expected to develop its version of the appropriations bill this fall, and conservation groups are urging the Senate to reject the House cuts. The special congressional debt-reduction “super committee” tasked with finding roughly $1.5 trillion in savings over the next decade could propose additional cuts to USDA’s voluntary conservation incentives programs, particularly if members of the committee cannot reach agreement on ways to increase revenue.